Chadis Crafts and Kippot-Hand Crocheted Yarmulkahs (Kippot, Kipot, Yarmulkes, Kippah, Kipah) Judaica, Hats Knit Scarfs, Jewelry and Gifts. Except on: The Jewish Shabbat. Plus Also Closed on MOST Jewish Holidays. Hundreds of one of a kind kippot in stock. Plus custom orders are my speciality. 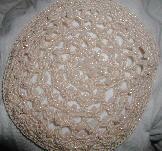 Eileen loves custom orders for Yarmulkahs, Jewelry etc! pocketbooks, flip flops and more. For All Life Cycle Events! What ever you call them..
HAND CROCHETED HEADCOVERINGS FOR THE WHOLE FAMILY! CUSTOM ORDERS ARE MY SPECIALITY! Special Bat Mitzvah Sets and Gifts. Special Kippot, Jewelry and Gifts. Not sure what to buy for a gift? Gift certificates available from Chadis Crafts $25 and up. http://www.chadiscrafts.com and for all craft designs.